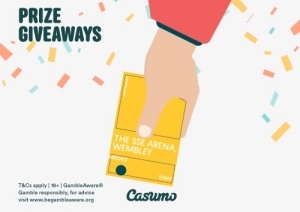 Casumo is back with a new giveaway, and this time they have partnered up with The SSE Arena, Wembley. If you can give the correct answers on the Facebook posts you could win a magical night at Wembley for you and a friend! The show is about to start, as Casumo is handing out several Wembley VIP tickets on their Facebook page until the 25th of September. The promotion is only available for UK players, and you just need to follow Casumo on Facebook for a chance of winning. A new prize is up for grabs every week, and you are not required to deposit or play at Casumo to participate in the competitions. A new question will be posted on the Casumo UK Facebook page every week, and your goal is simply to figure out the solution. Post your answer in the comment section and you will automatically get an entry into the weekly raffle where one player wins a pair of Wembley VIP tickets to one of the many amazing events the venue has to offer. This week is extra special, as the casino is giving away Terrace Suite tickets for the winner instead of the standard VIP tickets. Find Casumo UK on Facebook and make sure to answer the question of the week for a chance of winning this excellent prize - and keep an eye on your notifications in case you’re announced as the winner! If you’re craving some sweet slots action there are plenty of Reel Races to sink your teeth into this week. £2,000 in real wager free cash is the top prize for the grand winner of the upcoming special Reel Races. Try your luck in Starburst on Wednesday, Eastern Emeralds on Thursday, and NetEnt’s new blockbuster slot BerryBurst on Friday and Saturday. Face the other players and get your name on the top of the leaderboard, where several happy players can enjoy some seriously nice cash prizes. Casumo’s Reel Races is one of the most popular and innovative features of the UK online casino. There are several races happening on some of the greatest slots in the casino every day, and the winners can expect cash prizes and bonus spins. The goal is to score points by landing big wins and several wins in a row, and you can learn everything about the races by visiting Casumo. And don’t forget about the Reel Race marathon that begins at 18:00 CET on Sunday!